Leanne Hallowell trained as an early childhood educator and has worked in a variety of early childhood settings, as well as being the head of the Educational Play Therapy at the Royal Children’s Hospital (Melbourne). 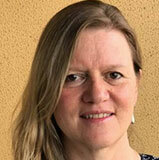 She is currently working as a lecturer in education at the Australian Catholic University, ACU. Leanne is working on her doctoral thesis, which looks at the engagement between children and medical doctors during the explanation of impending medical procedures. She completed her MEd (Melb) reviewing educational play therapy interventions with children undergoing MRI’s. Leanne joined the AWCH Board in 2016.